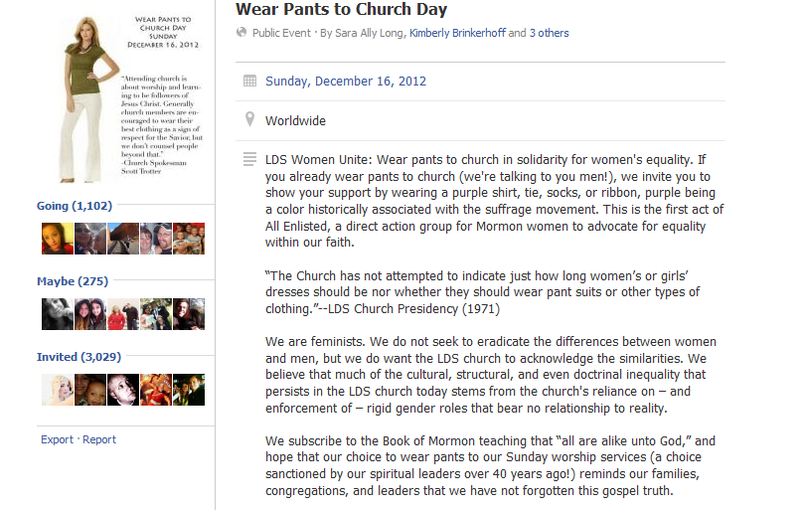 A group of feminists belonging to the Church of Jesus Christ of Latter-day Saints have declared Sunday December 16th, 2012 to be "Wear Pants To Church Day", and the campaign has attracted mainstream media attention, with the Salt Lake Tribune, the San Jose Mercury, and KSL Channel 5 picking up the story. Jezebel reports considerable opposition. You can see that this campaign has picked up considerable support, with 1,102 people declaring their intent to participate as of this post. Note that this is NOT A PLOY to campaign for extension of the Priesthood to women; they do not seek to eradicate the differences between women and men, but simply want to emphasize more of the similarities. The Gospel was meant to uplift all that it touches; bond and free, small and great, Jew and Gentile, male and female, etc. The Mercury reports that men who want to show solidarity are encouraged to wear a purple shirt, tie, socks, or ribbon, purple being a color historically associated with the suffrage movement. Since men normally wear pants, this is way deemed most appropriate for them to show solidarity. LDS spokesman Scott Trotter reacted, stating "Attending church is about worship and learning to be followers of Jesus Christ. Generally church members are encouraged to wear their best clothing as a sign of respect for the Savior, but we don’t counsel people beyond that." Institutionally, this is a true statement, but apparently many women have encountered bishops who substitute personal bias for Church doctrine. Bishops who engage in this type of behavior blur the line between priesthood and priestcraft. I come to church to worship God and not to think about not wearing pants or feeling unequal because of not doing so. This is our personal relationship with Heavenly Father and how we learn more about our Savior Jesus Christ. I guess we should deal with things that are necessary for our exaltation and I guess wearing a skirt forever or even changing into pants in church wouldnt affect much of our faith and testimony. In the Pacific, it is common for men to wear skirts (lava-lava) to church, yet they show reverence through doing so. I can just say that the church was never feminist by telling the women to wear skirts all the time. I just hope that members should deal with things that are eternal rather than temporal. This is a matter of free agency if you want to wear it or not. It should be a matter of free agency. But when family members or even Bishops take you aside and tell you you’re wearing the wrong thing, which happens frequently (it happened to me), it becomes a matter of not being able to worship God, and instead worrying about what you are wearing. Not through a fault of your own, but because of pressure from others. Dealing with this *is* necessary for our exaltation, as shown by the the many scriptures relating to 1) Keeping people out of church or looking down on them because of the way they are dressed, 2) Getting carried away with the letter of the law to the point where we forget the spirit of it. Allowing the problem to continue is to show acceptance of the idea that one must dress a certain way to be considered righteous, which is explicitly against LDS doctrine. One does not need to "look pretty" to get into heaven, but if one truly loves the Lord, one will dress in the best they have when visiting His house on the Sabbath, whether it be Dockers or Brooks Brothers. And for the ladies, that can mean either a dress, a skirt -- or a pants suit. 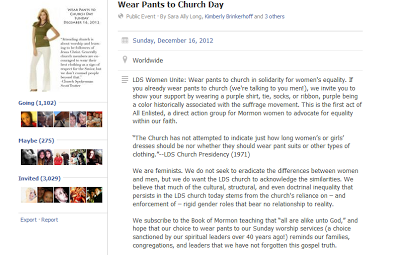 While I am anti-feminist, it has never occurred to me to question a woman who wears pants to church on the Sabbath. There are many more pertinent issues to confront. The Tribune wonders if LDS men will start agitating for a "No Neckties Day". While men are encouraged to wear ties to services, it's only customarily required of those who are officiating in some way, like the bishop and his counselors, various quorum presidencies, the priests who ask the blessing on the Sacramental emblems, and the deacons who pass the Sacrament to the congregation.